On any given night, 630,000 people in the United States are homeless. One in six of these people is a veteran and one in five has a child to support. With your support, we can begin to change these conditions through the thoughtful design of affordable, supportive housing for formerly-homeless populations; design that promotes physical and mental wellbeing, recovery, and community. Design makes all the difference for at-risk populations. Star Apartments in downtown Los Angeles is a perfect example. Since completing her fellowship in 2012 with SkidRow Housing Trust, Enterprise Rose Architectural Fellow Theresa Hwang has continued to use her design background to direct the development of this pivotal project. 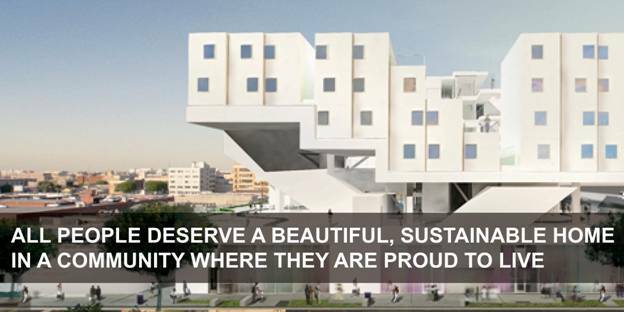 The results; 102 apartments for formerly homeless individuals; the first mixed-use, multi-unit supportive housing project employing entirely green construction methods in Los Angeles. Please help support our mission through our year-end CrowdRise Holiday Challenge. Plus, thanks to a generous grant from The Kendeda Fund, your contribution will be matched, dollar for dollar! To date, we are at 50% of our fundraising goal and the Holiday Challenge ends January 9th at noon. Again, my deepest thanks for supporting our work over the years, and thank you in advance for your support during the Holiday Challenge. And, if you donate $50 or more from January 5th at 12pm EST – January 8th at 12pm EST, you will automatically be entered to win a Droid Ultra Smartphone! This entry was tagged affordable housing, end homelessness, Enterprise Community Parnters, holiday challenge. Bookmark the permalink.